Besides being a departure point for Valnerina and Monti Sibillini, and boasting many churches and museums, Norcia’s main attraction is its food. Wild boar, lentils, cheese, ham, prosciutto, chocolate, farro, mushroom and black truffles.... Hunting truffles has become an art and a fun activity for tourists. Since Roman times Norcia has based meals around pork and specialized in different varieties. 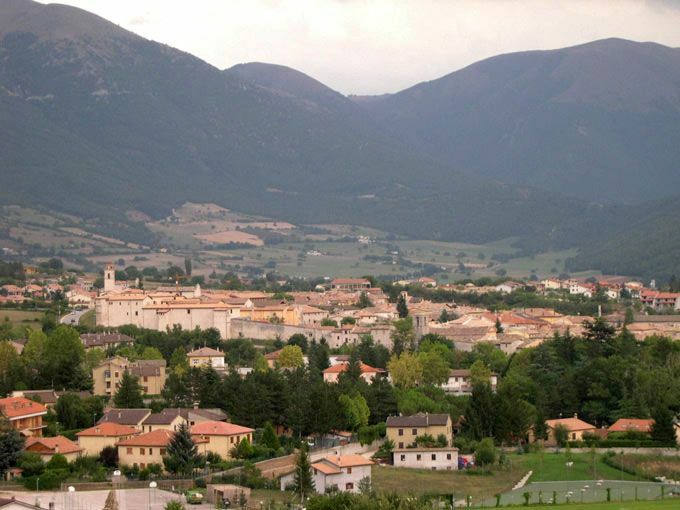 Norcia is recognized around the country as being the main centre for pork products and is famed for being the home city of the patron saint of Europe, Saint Benedict. The city sits mostly on the plain, Buses arrive at Porta Massari (Porta Ascolana). Most of its streets are pedestrianized but you will find parking outside the walls and close to Porta Massari. 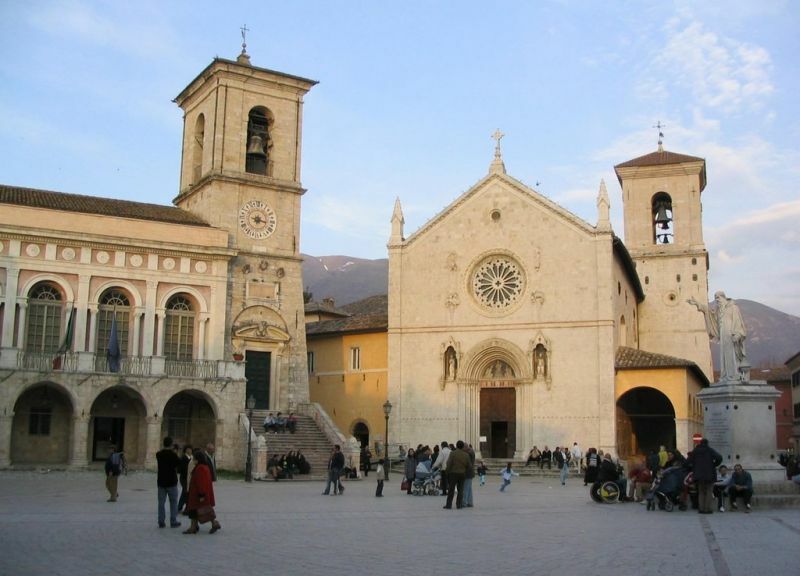 Norcia was the birthplace of the patron saint of Europe, and the basilica erected in his honour, the Basilica di San Benedetto, is on the piazza of the same name. It has the shape of a Latin cross, a many-sided apse, a 14th century bell tower and frescoes by Michelangelo Carducci , who was an inhabitant of the town. Among the frescoes is the Resurrezione di Lazaro and San Benedetto e Totila by Filippo Napoletano. Twice a day on Sundays the Benedictine monks attract an audience with their captivating chants. The Museo della Castellina Civico e Diocesano, located on the same square, displays a few Roman historical objects and local art. The entrance ticket gives you access to the Roman crypt of Porta Ascolana which is the vestiges of a little Roman necropolis. By the museum is the Cattedrale di Santa Maria Argentea erected in the 16th century. The building underwent modifications in the 18th century. However, it has kept its original doors. Its interiors are embellished by pieces of art by Flemish artists. On the same piazza the Palazzo Comunale has a part which was built in the 14th century and others in the 18th century. The Teatro Civico is an example of fine arts construction erected in 1872 and reconstructed in 1952 by inhabitants of Norcia as a fire had badly damaged it. More performances are offered at the Auditorium di San Francesco on Via Renzi. The Mostra Mercato del Tartufo Nero is held at the end of February and beginning of March. Throughout the mostra truffle and other product vendors flock to Norcia and let visitors sample the best Italian cuisine. Casa del Parco provides travellers with information about Monti Sibillini, guided tours, means of transport, strolling maps and summer excursions. Norcineria is a word that has spread in Italy meaning butchers. In Norcia,where the word comes from, norcinerias also sell dried meats. Other typical food of this area are cinghiale (wild boar), lentils, and pecorino cheese. Ristorante Granaro del Monte is a famed restaurant in the area which has been serving excellent food for one and a half centuries. The warm fireplace makes the huge dining rooms cozy in cold winters and in the summer there is an open air dining area. You should definitely try the house speciality: the veal dish with butter, black truffles and red wine. Go to Ristorante Albergo Benito to savour local meat and truffles. Norcia overflows with shops offering pork products of all different varieties. Norciafood is a company delivering food to any corner of the globe and sells all varieties of pork products in its large shop. Brancaleone da Norcia also ships its products which include pork and local products such as lentils and jam. 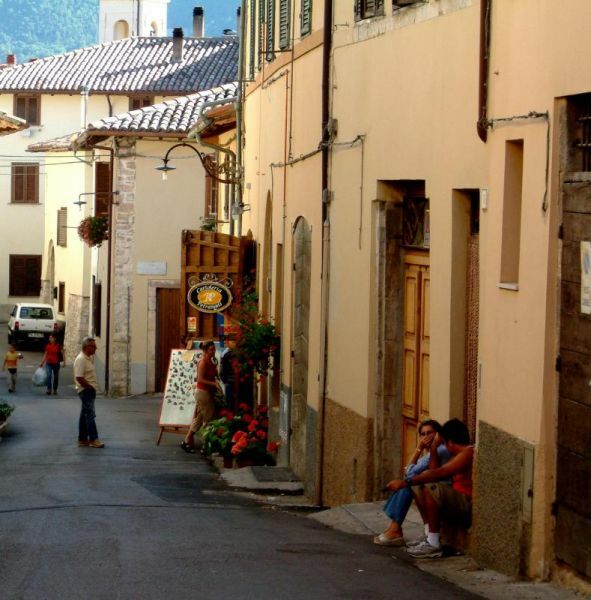 Chocolateria Vetusta Nursia is positioned just 1km from from Norcia on the way to Castelluccio. Here you can purchase all local products (except meat!) at good prices. Samples of the products are offered. They also have another shop in Norcia on Via Mazzini but the prices are higher. BY BUS: near Porta Ascolana is the bus stop. From Spoleto (duration: 1 hour, services: 5 a day), from Perugia (duration: 2 hours, services: 1 a day), to Castelluccio (duration: 40 minutes, services:2 on Thursday only with day return). BY TRAIN: the Spoleto railway station is the nearest to Norcia.